A Palestinian haggadist, of uncertain date and rarely cited, whose name appears also as "Bebai Rabbah," "Beba Raba," and "Beba Abba" (Lev. R. xxix. 9; Yer. Ta'an. ii. 65d; Pesiḳ. Baḥodesh, 154a; Yalḳ., Lev. 645). He is cited (Lev. R. iii.) as having commended the following form of confession for the Day of Atonement, which is partly adopted in the ritual for the evening service of that day: "I confess before Thee all the evil I have committed. I have indeed stood in the path of evil; but as I have done, I shall do no more. May it please Thee, O my God, to forgive all my sins, pardon all my iniquities, and remit all my errors" This, Bebai states, is in accordance with what the prophet teaches in saying (Isa. lv. 7), "Let the wicked forsake his way, and the unrighteous man his thoughts," etc. (compare Yer. Yoma viii. end, 45c). 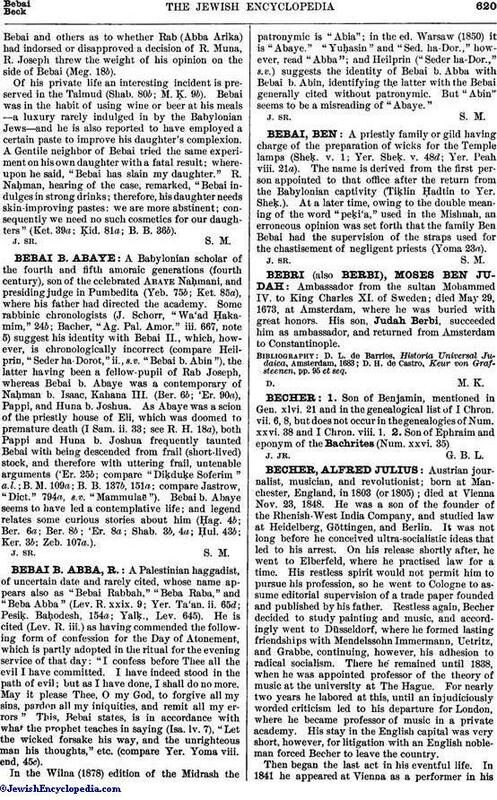 In the Wilna (1878) edition of the Midrash the patronymic is "Abia"; in the ed. Warsaw (1850) it is "Abaye." "Yuḥasin" and "Sed. ha-Dor.," however, read "Abba"; and Heilprin ("Seder ha-Dor.," s.v.) suggests the identity of Bebai b. Abba with Bebai b. Abin, identifying the latter with the Bebai generally cited without patronymic. But "Abin" seems to be a misreading of "Abaye."